The market broke its five-week losing streak and ended the week in green. Sensex rose 1.04%, while Nifty rose 1.51%. RBI’s decision to inject liquidity by purchasing government securities worth Rs 12,000 crore was well received by the market. Crude oil fell below $80 and positive quarterly results further bolstered market sentiment. 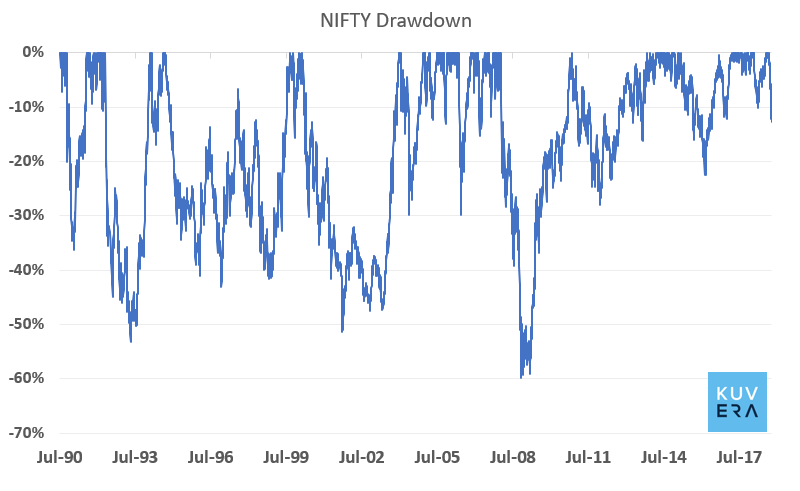 Over the past 28 years going back to 1990, Nifty has had a 10% or more decline every 14-16 month or so. Nifty is currently down ~11% from its peak. A 10% or more decline has been a good time to invest for the long term, i.e for 5 – 10 years. Net inflows into equity mutual funds rose to a four-month high of Rs 11,172 crore in September. The monthly SIP inflow was up 40% year on year at Rs 7,727 crore in September, compared to Rs 5,516 crore in Sep ’17. 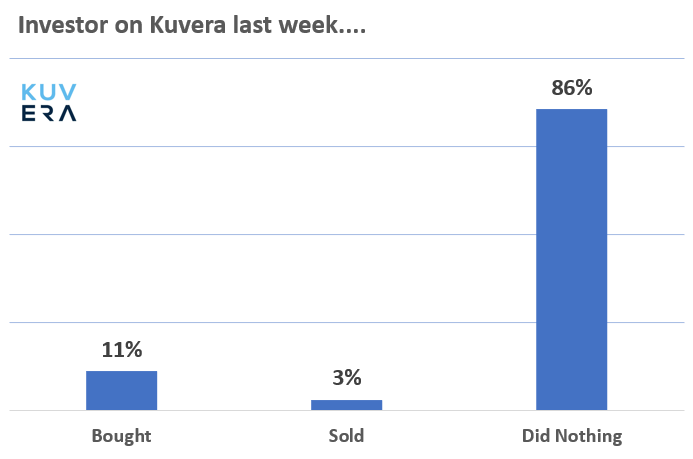 We looked at what Kuverians are doing during this phase of high market volatility, and it seems that they are doing exactly what smart investors should do – Nothing! BSE Sensex and NIFTY were up by 1.04% and 1.51% respectively. Small Cap rallied by 2.31% whereas Mid Cap Index went up by 2.02% for the week. 1/ DHFL Pramerica Mutual Fund announced the resignation of Rajesh Iyer from the post of CEO. Ajit Menon has been appointed as the interim CEO. 2/ Reliance Mutual Fund has sought SEBI nod to launch a Capital Protection Oriented Fund. This close-ended fund will be investing primarily in debt and money market securities. Unlike your doctor, lawyer, or accountant, your broker is not a ‘fiduciary’: that is, he is under no legal obligation to place your interest above his.